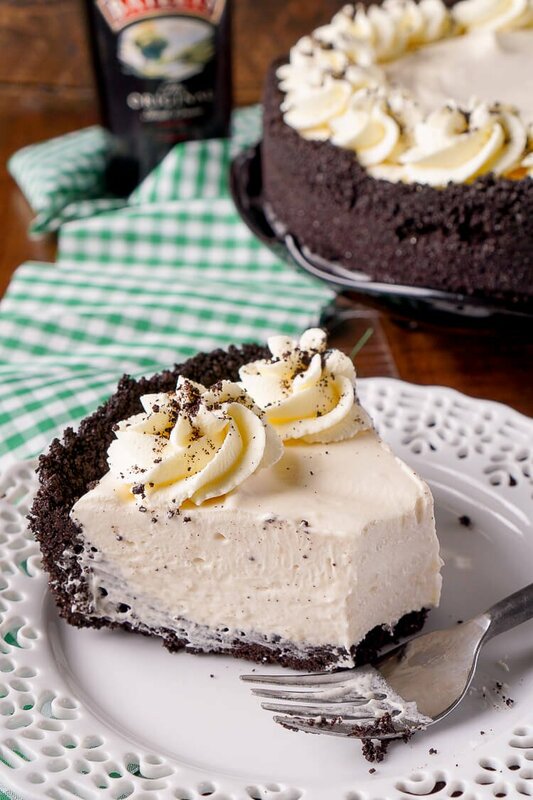 This Irish Cream Pie is an easy dessert laced with Bailey’s and perfect for St. Patrick’s Day! How is March already half way over? It seems like we were just ringing in the new year and now we’re just days away from St. Patrick’s Day and Easter is right behind it! 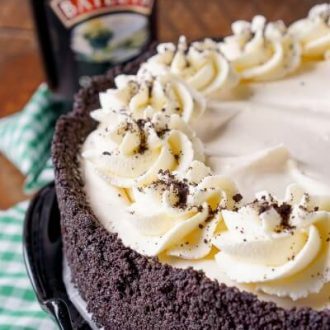 I’m pretty sure that calls for adding a little extra something to your cream pies, Baileys Irish Cream! This is a no bake pie, so don’t let the 4 hours and 35 minute prep time scare you since 4 hours and 20 minutes of it is inactive chill time. Don’t you love a dessert that pretty much makes itself? The crust is made from Nabisco chocolate wafers that have been blended and mixed with sugar and butter for a rich shell. The filling itself it made with milk, marshmallows, Irish cream liqueur, and heavy cream, nice and simple! For a non-alcoholic version, use the Baileys Original Coffee Creamer in place of the liqueur. The filling is stable and easy to cut through while maintaining a silky smooth texture that just melts in your mouth. 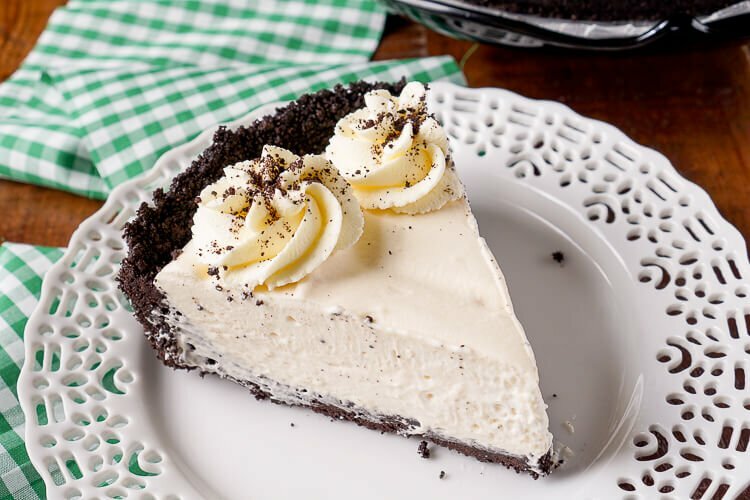 If you’re an Irish Cream fan, you’re going to love the way the bold flavor comes to life in your mouth with the chocolate crust and whipped cream topping! And since today is Pi Day (3.14159265359 and so on), Ifigured what better day to celebrate than with a St. Patrick’s Day inspired pie! 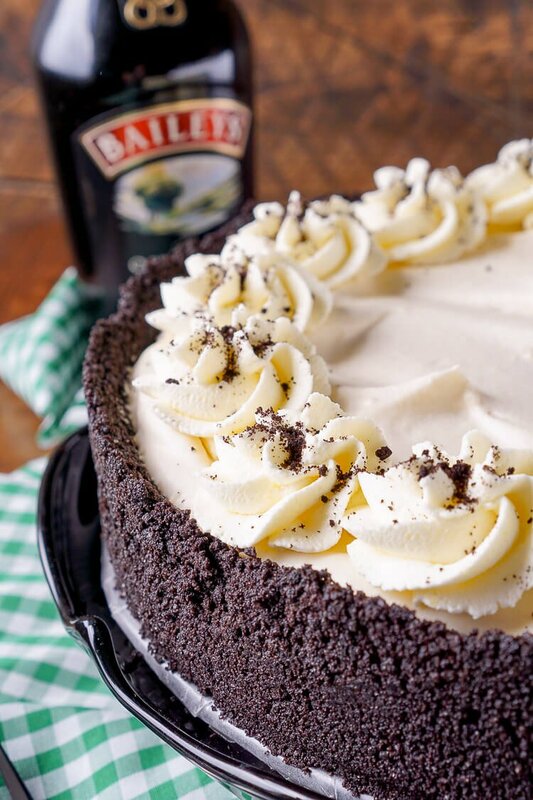 This Irish Cream Pie is an easy dessert laced with Baileys and perfect for St. Patrick's Day! 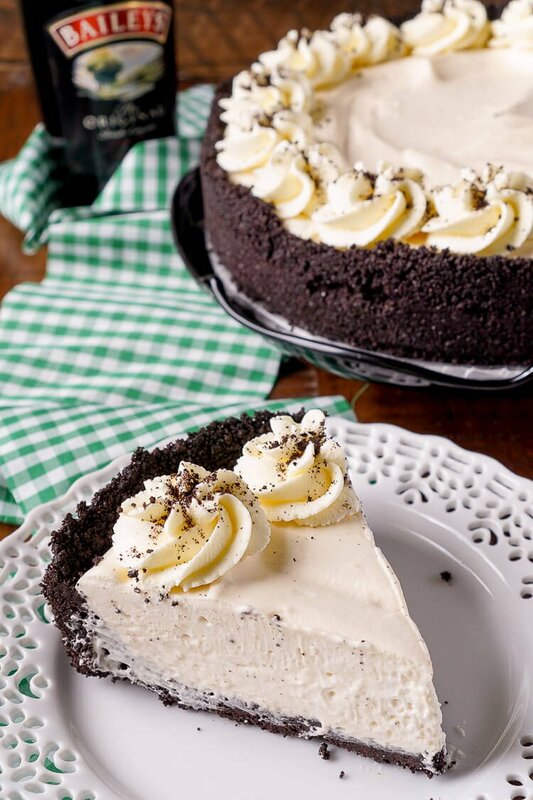 A chocolate cookie crust filled with a cream marshmallow and Irish Cream filling and topped with vanilla whipped cream! Add wafers to a blender or food processor and pulse until fine crumbs form. Pour crumbs into a medium bowl, reserving about 2 tbsp, and stir in the sugar, then make a well and pour in melted butter and mix until evenly coated. Press into the bottom and up the sides of a 9 or 10-inch springform pan. In a medium saucepan, heat the milk and marshmallows over low heat, stirring constantly, just until marshmallows are melted. Pour into a medium bowl and refrigerate for about 20 minutes, stirring occasionally, until mixture mounds slightly when dropped from a spoon. Gradually stir in Irish Cream until smooth. Whip the heavy cream on medium-high speed in a large bowl or stand mixer until stiff peaks form, fold the marshmallow mixture into the heavy cream and mix gently until fully combined. Pour filling into prepared pie crust. Refrigerate for at least 4 hours and up to 48 hours. Just before serving, in a medium bowl or stand mixer fitted with a whisk attachment, beat the heavy cream, confectioners' sugar, and pudding mix on medium-high speed for about 2 minutes until light and fluffy. 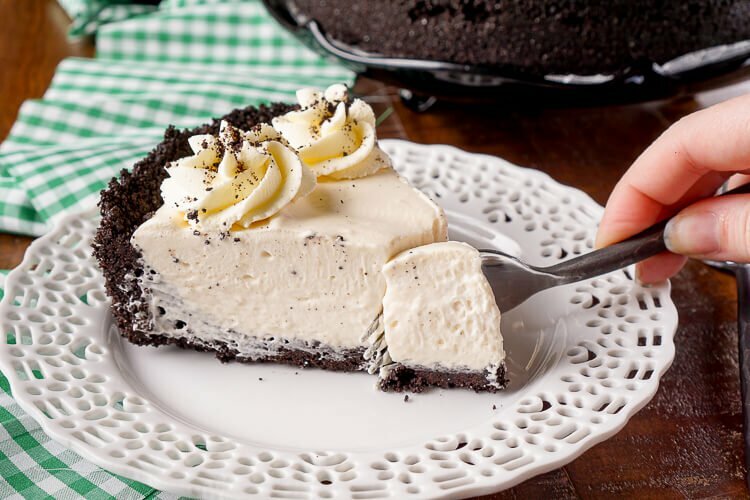 Pipe cream around the edges of the pie and dust with the reserved cookie crumbs. For a non-alcoholic version, use the Baileys Original Coffee Creamer in place of the liqueur.